Throughout Africa a wind of change is blowing as mobile network operators ponder, and in many cases implement, a wave of network modernization. The trigger for this is multi-faceted. Booming subscriber growth, introduction of new data services and arrival of new undersea fiber optic cable links are combining to strain existing network infrastructure to the breaking point. According to the GSMA , as of September 2011 Africa has overtaken Latin America with 620m mobile connections, making it the second largest mobile market in the world after Asia-Pacific. The number of connections has more than doubled over the past four years, with growth expected to continue at the fastest rate of all global regions over the next four years. Most networks across Africa were built many years ago to serve the initial rollout of 2G/GSM mobile networks that were designed to provide basic voice services. Many operators have since introduced data services using EDGE, 3G WCDMA, and, more recently 3G HSPA, putting an incredible strain on these networks. These data services can be vital for the operator, as they are often supporting premium, prepaid subscribers or new fixed line data services being offered for small and medium-size businesses. One example of network modernization in action is in East Africa, where a mobile network operator saw subscriber numbers increase 9 percent in 2011, with 3G customers increasing more than 85 percent. This operator was also offering fixed data services to private and corporate customers through the deployment of WiMAX base stations collocated with the existing mobile sites. All this new data traffic was growing exponentially and fast outstripping the legacy backhaul network capacity. The operator also had to ensure that existing voice traffic was protected. These five priorities are closely interrelated. For more details, download the complete article. 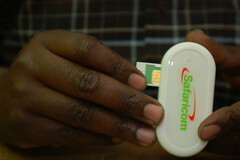 By now, you have seen the blogs, read the tweets and perhaps watched a YouTube video about “4G” mobile networks. In these postings, various claims and counterclaims have been made for what really defines 4G wireless. Further down in the industry dialogue, debate has been swirling among the ITU, IEEE 802 and various telecom analysts and pundits about what constitutes 4G. The technical acronyms LTE, WiMAX, HSPA+ and perhaps others have floated through the ether, creating more confusion than clarity. All this happened when ITU let the genie out of the bottle in late 2010 and loosened the technical definition of what is truly 4G. The answer had been mobile technology capable of 100 Mbps+ downloads. However, ITU seems to have given mobile operators and others with vested interests enough leeway to define 4G as any mobile broadband technology that is faster than “3G,” which enjoyed a similar hype and uncertainty when it debuted in the early 2000s. And so began the public’s conditioning to equate more Gs with faster throughput. Of course, all these Gs only refer to the generation of mobile technology, currently in its third generation in most places, with some limited availability of fourth generation technology. For the record, 4G technology in ITU’s strictest sense only refers to Long Term Evolution (LTE) Advanced and WiMAX 802.16m. Even current LTE and WiMAX 16e installations do not qualify. They are evolutionary steps on the road to 4G. And though HSPA+ is a fast download technology, it is still a third generation mobile telecom technology. Still, some HSPA+ carriers are achieving 21 Mbps downloads—faster than the 12 Mbps of early LTE carriers. With a software upgrade by the end of 2011, HSPA+ carriers can conceivably get up to 42 Mbps—but that is the theoretical maximum. Someday, LTE operators could hypothetically top out at 300 Mbps, but that day is not in the immediate future. What is immediately apparent and most important is what 4G means to the end user. Most people cannot be bothered to dive into the technical details of mobile broadband technology, even if they are capable of grasping its intricacies. What they can grasp is faster mobile video loads with a minimum of latency and lack of jitter. What they can get is the mobile Internet displaying web pages with images in place and not red Xs or empty pictureholders. What is important is delivering content to the end user—wherever she is—faster than she expects, however many Gs it takes….